Final Frontier Medical Devices' tricorder won first place, and $2.6 million, in the Qualcomm Tricorder X Prize competition in April 2017. "It would be amazing if the tricorder actually made it back out into space again," he added, specifically citing NASA's stated goal of putting boots on Mars. "That would be a great application for something like this." In April, FFMD took home first place (and $2.6 million) in the Qualcomm Tricorder X Prize competition. Teams that entered the contest set out to create an easy-to-use, lightweight (less than 5 lbs., or 2.3 kilograms) device that would allow laypeople to monitor their vital signs and diagnose a variety of common health conditions. Charron's talk at the meeting focused on Pennsylvania-based FFMD's winning entry, which the team calls DxtER (pronounced "Dexter.") 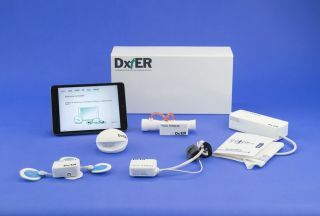 The team approached DxtER's design from the perspective of an emergency-room doctor, Charron said, which makes sense, considering that's the profession of FFMD co-founder Basil Harris. This decision entailed building out artificial intelligence based on the standard, noninvasive ER diagnostic method, Charron said; taking samples of blood, urine or other substances would be done only if absolutely necessary. FFMD wasn't the only X Prize tricorder team represented at the conference. Chung-Kang Peng of second-place finisher Dynamical Biomarkers Group spoke Monday, as did Eugene Chan, of finalist DNA Medical Institute (DMI). Chan's presentation highlighted the space potential of real-life tricorders as well; team DMI created its device, dubbed the Reusable Handheld Electrolyte and Lab Technology for Humans (rHEALTH) sensor, with the aid of NASA funding. "Developed to monitor astronaut health on the International Space Station (ISS) and during long-term spaceflight, terrestrial applications for this groundbreaking technology include point-of-care (POC) diagnostics at a patient's bedside, in a doctor's office or hospital," NASA officials wrote in an rHEALTH fact sheet.